Dustin Johnson Exteriors & Roofing is a reputable roofing contractor in Austin, Texas that is also immersed in providing outdoor comfort for property owners. During the lazy and hazy days of the summer season, it is typical for homeowners and family members to spend time outdoors. Dustin Johnson Exteriors & Roofing Modular Pergola System offers a great and affordable alternative to give yourself and your family an opportunity to spend time outdoors while having less concern for the summer heat. 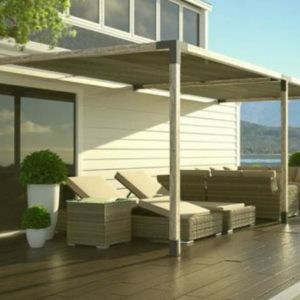 Depending on your preference and you need, you have many Pergola System to choose from. If you have a larger space outside, you may want to avail the Double Pergola & Double Side Pergola, and each comes with a shade sail. Each Pergola System comes with shades that block approximately 90 percent of UVA or UVB rays. Hence, truly providing you with a comfortable and safe environment. Other included item to expect when you purchase a Pergola System is gauge steels, that are laser cut and robotic welded. Apart from our highly sought Dustin Johnson Exteriors & Roofing Modular Pergola System, you can also count on us to provide you services involving your roofing, windows, siding, gutters, garage doors, and other home improvement needs you might need. Contact Us Today!